Originally scheduled for 2/17/15, this presentation was moved to 3/31/15 due to snow. On March 31st, 2015, The New Century School hosted a community presentation on how to keep children safe from sexual predation. Said Head of School Alicia Danyali: “[How To Be an Askable Parent] is to not create an alarmist mentality, but to inform and educate parents to the realities and practical approach to conversations with your child at any age.” Crimson Barocca, LCSW-C, Senior Forensic Interviewer with the Baltimore Child Abuse Center led the presentation. “It was a great discussion and maybe we can repeat at some point in the future!” she said. 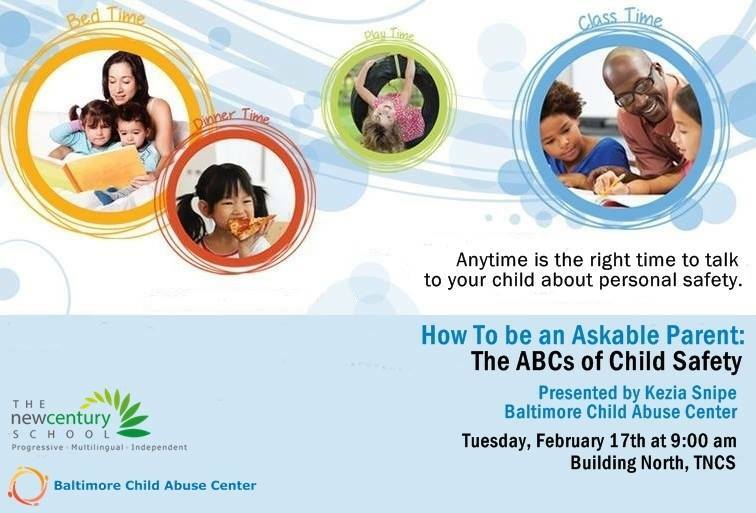 This is good news for those who were unable to attend, because this topic—while not the cheeriest—is of paramount importance for parents. Two myths she dispelled during the talk are that preschool-age children are too young to understand this topic and that children should use euphemisms for their body parts. You can talk to your child as soon as you feel he or she will understand you, and using anatomically correct terms for body parts is actually a means of protection for your child by demonstrating to a potential predator that he or she is educated about this topic and therefore not such easy prey. One primary goal of the presentation was to help parents learn how to decrease kids’ vulnerability. And that again comes down to communication. Ms. Barocca shared lots of helpful tips for how to start talking about this uncomfortable subject. One point she emphasized was that, although it is certainly important to talk about so-called “stranger danger,” it is just as important to talk about people your children know and trust. Most abduction and abuse happens at the hands of people children know very well, not strangers. But how do you broach this subject with young children without terrifying them? Emphasizing the safety aspect rather than danger will go a long way to preventing or reducing their anxiety. The National Center for Missing and Exploited Kids (NCMEC) provides Discussion Guides broken down by age group (download them here). The singlemost effective means of protecting your children is communication, because if they know they can talk about their true feelings, they will be more likely to reveal that they have been in an uncomfortable situation. Currently, only about 10% of children who are sexually abused report it. Ms. Barocca drove home the message that 90% of abusers are known to the child—doctor, clergy, neighbor, family, etc. She also updated the good touch/bad touch metric to safe touch versus unsafe touch to make this concept clearer for children (sometimes what we would consider a “good” touch can feel bad to a child, such as getting a shot, whereas a “bad” touch such as inappropriate tickling can feel good). Using the terms “safe” and “not safe” eliminates this possible confusion. This is a great starting point for your conversation. You can give examples of safe touches, such as well-check exams at the doctor’s office or being washed by parents in the bathtub. Ask your child to give an example of a safe touch so that you can be sure the concept is understood. Then, inhale, move onto unsafe touches. A sickening fact is that 1 in 4 girls and 1 in 6 boys will be sexually abused by their 18th birthday. Explain what this means (such as an adult asking the child to “play a game” of touching private parts) and, again, ask the child to give you an example to demonstrate understanding. Next, emphasize to your child that he or she must tell you right away if he or she ever experiences an unsafe touch and keep on telling until you receive the message. The predator has likely commanded the child to keep quiet, so be sure to explain that this is not a situation to keep secret. Finally, two extremely essential parts of this conversation are that 1) make sure the child knows this is not/would not be his or her fault—it’s always the adult’s fault—and 2) reinforce to the child that as the parent, it’s your job to protect him or her. Make sure your children understand . . .
That you will never send a stranger to pick them up from somewhere. Establish a “code word” that anyone picking them up unexpectedly would know—“meatball,” “pierogi,” etc. Make it something pertinent to your family but that a clever stranger wouldn’t be able to guess. A grownup should never ask a child for help with directions or finding a lost pet. Run away if approached. That if separated in a store or park, to stay where they are; you will find them. Tell them to seek help from another nearby mom. That it is okay in any situation in which they feel uncomfortable to walk or run away and, if grabbed, to yell, kick, scream, and do whatever it takes to draw attention. Teach them to yell, “This is not my [parent]!” to alert passersby. That they have the right to say no to any touch or actions by others that makes them feel scared, uncomfortable, or confused. Reassure them that they can tell you anything. The anatomically correct terms for their body parts. Educated = less vulnerable. For parents to be especially mindful of . . .
Look and listen to small cues and clues that something may be troubling your children. Some children may not be able to tell you when something happens, because they have been threatened that bad things will happen if they do. Pay attention if they tell you they don’t want to be with someone or go somewhere. Children may be especially fearful of being punished, being embarrassed, or experiencing the loss of the love and respect of their family members and friends. If your children do confide in you, remain calm, noncritical, and nonjudgmental. Establish rules and guidelines for computer use for your children (see Netsmartz and Net Nanny). In addition to providing some helpful handouts such as a Family Safety plan (download here), Ms. Barocca shared lots of great resources to help us navigate these treacherous waters. Click Recommendations for her list of recommended books. 1-800-THE-LOST (1-800-843-5678): 24-hour hotline or cybertipline for reporting information about a missing child or suspect child sexual exploitation. This entry was posted in Parenting and tagged Baltimore Child Abuse Center, Crimson Barocca, how to be an askable parent, Mary L. Pulido, National Center for Missing and Exploited Children, National Child Safety Council, Net Nanny, Netsmartz.org, Ph.D., safe versus unsafe touching, stranger danger, Take 25, Talking to Kids about Anatomy, The New Century School, Tricky People Are the New Stranger. Bookmark the permalink. Important blog topic. Thank you for all of the links and resources!